It’s that time of the year again! The time before the New Year, post Christmas where we tend to be filled with goodies, love and feeling contemplative. I have wrote about how to get ready for the new year before. Working on those same concepts of generating desires, ideals and manifestations and then setting intentions and goals. These are so crucial for us to get centred and aligned with what we want to achieve not only in the upcoming year, but also in the far flung future. Personally when it comes to generating content, I am not the best at it especially blogging (looking at the timelines of my previous posts bringing me to shame unfortunately). However, this exercise that took me an hour of close reflectiveness is so important that I choose to share via this blog post! For those of you who do not intend to return to my previous posts on this, let’s do a quick run through right here shall we? First up: generating your Desire List and Redefining your Current Goals. Use words like ‘ I want’, ‘ I envision’, ‘I desire’ to start off your sentences and you will come to realise how much of your wants you are actually envisioning in your mind already. I like the word envision because it gives that goal a reality that is forming in your subconscious and your mind is powerful enough to work towards that. For example: I envision living a lifestyle that generates as little waste as possible, I desire to gain fresh connections & friendships, I want to own a dog, I want to be more vulnerable. Being varied in your listing helps that attraction process. 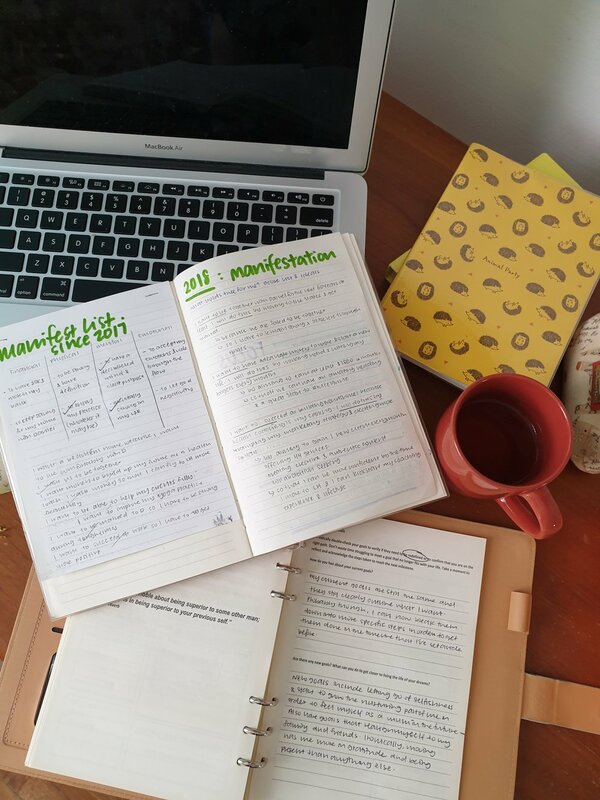 In the photo above, you can see my manifest list containing my goals in terms of financial, mental, emotional and physical means has been the same since 2017. This means that they are still aligned to me and my life in the coming year. I do not intend on changing the big goals but do have some idea of smaller steps that I can do to really achieve this by 2019. These smaller steps are what we term as Redefining goals, and they are the sort of new goals that will get you closer to living your dreams. Examples of mine include letting go of selfishness and start growing the nurturing aspect of my being in order to cultivate my motherhood instincts coming into the new year. Next, in terms of creating your Ideals List, write down your top desires in big sentences and narrow them down into steps. I envision new friendships and connections and I will establish this by joining women-only groups and events, connecting through social media and attending local events. These are merely examples from my own writings and yours can be entirely different! What am I saying, of course they will be entirely different because we are entirely different beings! Finally, you are ready to create a timeline and your intentions! The photo above depicts my timeline for the upcoming year and I like to split it into a month, 6 months, 12 months and 5 years. You can choose to do 1 year, 5 years, 10 years, 20 years. Have a varied range that covers your immediate future but also far flung futures because time flies! Review this timeline every month or so and alongside your intention list. The intention list is very important as it will keep you grounded and aligned to your goals and how you are going to live by your mantra in order to achieve them. 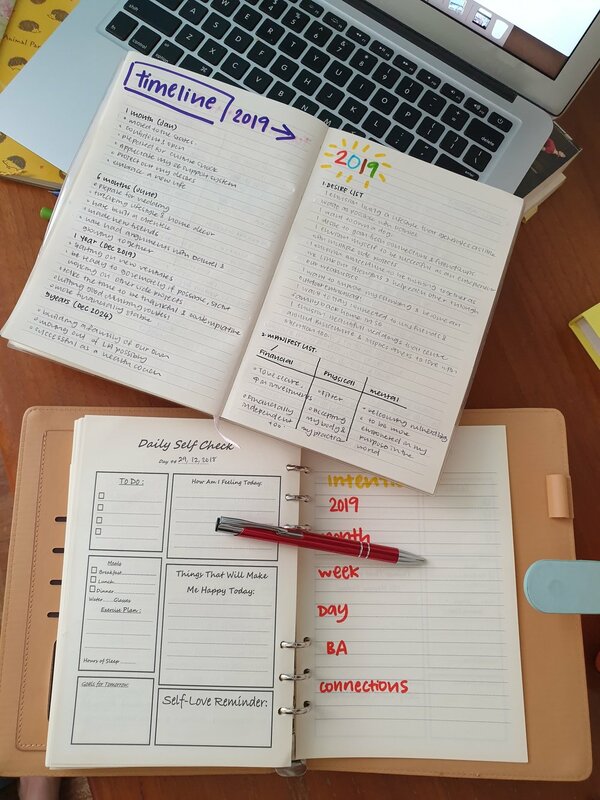 I put mine as an overarching mantra that covers the year, which I then break down into every month, week, day and how it is going to affect my personal relationship with my fiance and strong goal of having connections. Again, this could be entirely different for you. Maybe you choose to align your intention with your family relations instead or your relationship with your boss and the work environment etc. Looking at these themes, the one that stood out for me the most is willingness to explore! Discover! Create! This would then be my intention for 2019 and I will obtain this willingness by simply being curious about everything. After all, when we move to a different location altogether, the best thing is to be curious because with curiosity comes openness, authenticity, vulnerability, communication and hope. Hope brings about the drive and motivation that will get me to be successful and also creates confidence whenever I thrive. As you can see, the themes are all linked and they branch out from that pure mantra that is going to see you through the year. Once you have got this, break it down further! How do you get to your intention every month, every week, and every day? For me, it is going to be finding something new to try every month, working on a new skill every week etc. You can see how this clearly defines an outline for living and for creating a thorough roadmap. In terms of specificity, you can even break it down further every month by using the Circle of Life tool. This tool breaks down the pillars of health into areas of spirituality, relationships, fitness, nutrition, creativity etc. and really helps you hone in on staying accountable to your goals! Completely overwhelmed by setting intentions and creating that magnet? I am here to help you personally and guide you through this process. Time and time again, we stumble through life without having a purpose that is keeping us driven and grounded. What better way to start off a new year by laying down the groundwork first?